Tower Rock stands amid tall cliffs lining both sides of the canyon. These sandstone rocks were once ancient sand dunes. Photo by Douglas A. Sprinkel, Utah Geological Survey. Sheep Creek Canyon Geological Area (SCCGA) is a scenic locale depicting almost 800 million years of geologic history, situated on the north flank of the eastern Uinta Mountains just west of Flaming Gorge National Recreation Area. Drive the loop road through the geological area to see stunning views, spectacular cliffs, dramatically tilted and folded rock layers, and the Rocky Mountain bighorn sheep for which the creek is named. Signs along the road within SCCGA point out the different geologic rock formations. The oldest rocks of SCCGA were deposited in an ancient basin around 770 million years ago, first in streams, then in both non-marine and marine environments indicative of an encroaching sea. Strata representing the subsequent 410 million years are missing (unconformity). Either these rocks were never deposited or were eroded away before the geological area’s next rock formation was deposited, but regional evidence suggests that this area was at or above sea level during this time. Seas flooded this region approximately 350 million years ago, and for 65 million years shallow marine and coastal sediments were deposited until the seas completely withdrew and an eolian (wind-blown) sand environment dominated. Succeeding the sand dunes, the youngest rock formations in SCCGA were deposited in marine environments that were separated in time by a sea-level drop and a 10-million-year unconformity. Rocks younger than 245 million years old have been eroded from SCCGA, but are preserved just north of the geological area’s boundary. These rocks reveal that deposition of marine and non-marine sediments continued until about 70 million years ago when the area began to rise during the Laramide orogeny, causing the seas to retreat forever and the Uinta Mountains to form. During this time of mountain building (70 to 40 million years ago), the rocks in SCCGA were uplifted, eroded, faulted, folded, and tilted steeply northward. Geologically recent deposits in SCCGA include sediments and rock debris from landslides, debris flows, rivers and streams, and talus. As you travel through SCCGA, you will see many interesting geological features. Three main geologic sites along the loop road are highlighted in this article: Sheep Creek Canyon overlook, Palisades Memorial Park, and Tower Rock. The Sheep Creek Canyon overlook, at the southern boundary of the geological area, presents a panoramic view of the strata and structure of SCCGA. From the viewpoint you can see the red rocks of the 770-million-year-old formation of Hades Pass that were emplaced against the much younger gray rocks of Deseret Limestone (about 350 million years old) by a fault during uplift of the Uinta Mountains. These strata were also folded and tilted during that time. The Deseret Limestone cliff is known as The Palisades. Palisades Memorial Park provides a sobering reminder of potential dangers associated with geologic processes, in this case a rainstormtriggered debris flow. During the stormy night of June 9, 1965, seven family members perished when a devastating debris flow swept down Sheep Creek and through their camp, destroying their trailer and the Palisades campground. The debris flow originated about a mile upstream, likely where Sheep Creek undercut part of a large landslide causing rocks and soil to slump into the creek. This debris and other material scoured from the channel banks along the way were carried rapidly downstream, probably arriving at the campground only a few minutes later. After this tragic event, the U.S. Forest Service designated the old campground site as Palisades Memorial Park and restricted its use to daytime only. A bouldery debris-flow levee is preserved west of the picnic area and contains some misshapen water pipes and other metal from the campground. 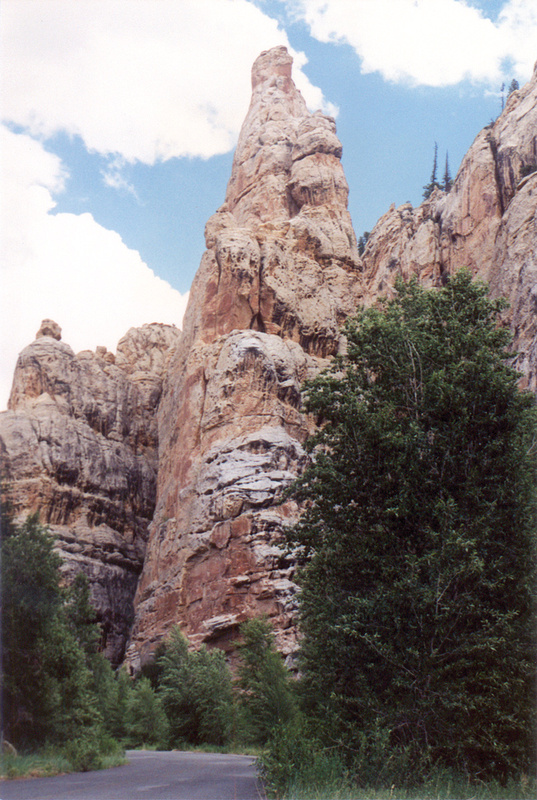 Tower Rock, in the northeastern section of SCCGA, is a hoodoo rock formation that resembles a tower constructed against the steep cliffs that rise alongside the loop road. A hoodoo is a rock pillar that has been carved into a fantastic or eccentric shape by different rates of weathering and erosion of different parts of the pillar due to variations in the rock’s resistance. Tower Rock is composed of Weber Sandstone, and the large-scale cross-bedding and well-sorted quartz sand grains indicate that this sandstone was originally wind-blown sand dunes. These ancient dunes accumulated around 285 million years ago during Early Permian time. The loop road through SCCGA extends for 13 miles on U.S. Forest Service (USFS) Road 218. This road is closed in winter. From the North – After driving into the town of Manila on Utah Highway 43, turn south onto Main Street/Utah Highway 44 and continue for almost 6 miles to the intersection with USFS Road 218, which marks the northern starting point of the loop road. Turn right (west) onto USFS Road 218 and drive 3 miles to SCCGA. From the South – From Main Street in Vernal, turn north onto Vernal Avenue/U.S. Highway 191 and after about 35 miles continue driving straight as the road name changes to Utah Highway 44 (do not continue on U.S. Highway 191, which makes a sharp right turn here). Continue traveling for almost 14.5 miles to the intersection with USFS Road 218, which marks the southern starting point of the loop road. Turn left (west) onto USFS Road 218 and drive approximately 6.5 miles to SCCGA.